The Transferable Experimental Station is a versatile sample mounting system with completely UHV-compatible electrical connections. Mount simple samples or build up complex experiments at atmospheric pressure. 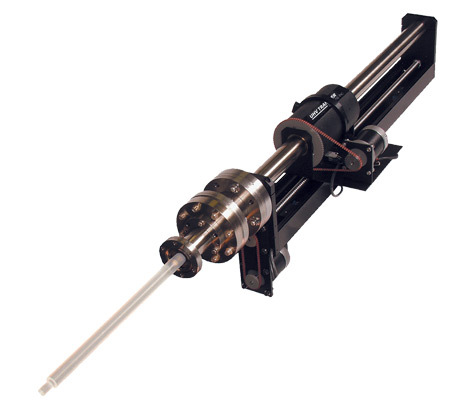 Then, using the rugged UHV Transfer Precision Magnetic Manipulator, the sample or experiment can be reliably transferred into a vacuum system, moved from one chamber or station to another, and repeatedly engage and disengage electrical connections. The UHV-compatible banana plugs providing the electrical connections on the sample puck were developed by UHV Transfer. These exceptional plugs are manufactured from BeCu, 304 stainless steel, and ceramic and are Au-coated for enhanced electrical performance and reliability. Chromel/Alumel plugs are also available for use with K-type thermocouples. The possibility of Zn sublimation from the brass used in traditional connectors in the vacuum chamber has been completely eliminated. Minimum Tube ID for Transfer 1.30" 2.40" 3.5"
Heater Size .5" 1.0" 2.0"
Typical Sample Size 1.0" 1.75 2.5"
Precision Magnetic Manipulators can be customized to meet a wide range of configurations. Internal shafts can be machined with threads, threaded holes, flats or slots. Shafts can be constructed of different materials such as the quartz shaft shown for use in a furnace. 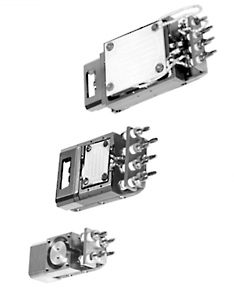 Optional items such as bakeable magnets and configurations with triple the de-coupling force are just a few examples. Call us to discuss your requirements. Download a PDF file of the PMM Datasheet here and view other custom systems.